There is an interesting and unconventional new player in the tactical communications space that has garnered the attention of leading soldier modernization programs such as NettWarrior (US), Morpheus/DSA (UK), Network-Enabled Army (NZ), as well as a variety of Special Operation Forces combatant commands across the globe. This new player is goTenna. Originally a recreational product company focused on hikers and skiers, goTenna creates mesh-networking radio systems designed to work with smartphones to allow them to communicate securely over large distances without any dependence on external infrastructure. 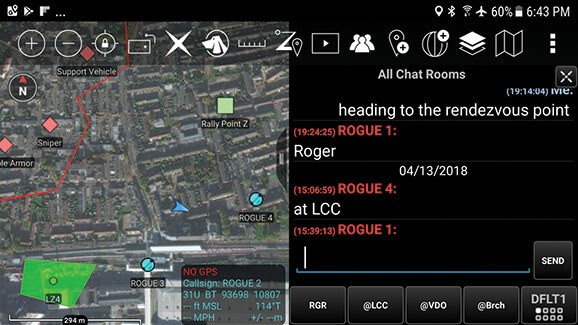 Working with apps such as the USSOCOM’s Android Tactical Assault Kit (ATAK), that recently became the primary battlespace management platform for NettWarrior1, the goTenna radios enable these systems to continue to communicate critical situational awareness information like blue force tracking (BFT), cursor-on-target (map marking), biometrics, and text messaging in environments where they would traditionally be off-grid. However digital mesh networking tactical radio systems are a relatively well-known product space for soldier communications systems, and a few radio systems that support these kinds of smartphone-based platforms exist already, so why is this Brooklyn-based startup drawing the eye of major program managers? goTenna systems are less expensive. Radically less expensive. A goTenna Pro radio system is a 5-watt VHF/UHF software-defined cognitive mesh radio that costs only $499 per unit, as opposed to the $15,000+ unit cost that traditional systems will run a program office. Not to mention they also only weigh 79 grams and take up 60 cubic centimeters in volume. When a product arrives on the scene that cuts SWaP and cost at unprecedented levels (1/30th the cost on average), and provides similar core utility to legacy comms systems; it shouldn’t be surprising that leading programmes are taking keen notice. As interesting and possibly disruptive as this is, one must answer the question of “how.” How is it that a small Brooklyn-based startup can suddenly enter the highly competitive and mature tactical radio market, where billions of dollars and decades of research have been invested, and suddenly provide a truly new tactical radio system that delivers on the holy grail of reduced cost, size, weight, and power that every soldier system program has been looking for for decades? The answer is relatively straightforward. goTenna re-examined the requirements for tactical communications from the ground up, and in doing so found that there was a very different way to think about the needs of a soldier at the tactical edge that enabled the design of a entirely new class of radio. Unlike legacy radio designers, who historically seem to be solely striving for ever higher and higher bandwidth – goTenna decided to go a different path. Effectively goTenna is forcing program offices to re-examine their requirements and draw a line between capabilities they may want, versus capabilities they truly need. goTenna’s thesis is that situational awareness data in the form of blue force tracking, red force map marking, and messaging form a 99% solution for the overwhelming majority of combat roles. They do not discount that certain higher bandwidth services may sometimes be needed, like video, but they challenge the approach that such large data streams are capabilities that should be broadly distributed to every role. goTenna’s insight then was to see that these critical red and blue dot data streams, as well as messaging, could be achieved with incredibly small bursts of data, allowing them to create a radio and associated mesh networking protocol that was radically more energy and spectrum efficient than anything else out there, which in combination with leveraging the smartphone platforms for processing and user interfaces, allowed them to significantly cut SWaP and cost for the radio system itself. The end result has been a radio system that program offices are able to look at as not only a technical capability, but a practically deployable capability which they can rapidly field to their entire combat force at a fraction of the cost of trying to deploy legacy systems to just a small subsection of their forces. These radios are enabling program offices to deploy creative architectures like strapping radios to drones, or breadcrumbing them in tunnels, to establish comms in RF-denied environments without fearing the loss of a capital-expense level piece of equipment. This is particularly powerful considering the importance of partner/coalition force operations in modern conflicts – the new goTenna systems provide a practical and affordable solution to interoperability through the simple distribution of spare radios to anyone you need to get on the network – without worrying about loss, crypto security (more details on this later), or restrictions like ITAR. It is a rare event when an entirely new class of tactical radio enters the market, a low-bandwidth low-cost low-SWaP radio for SA and C2, but it seems like we’re currently witnessing the beginnings of just such an occurrence.